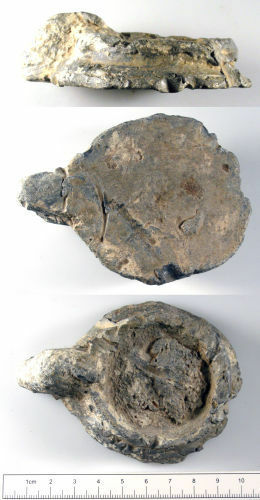 A lead bung from the mouth of a large medieval vessel. The object is circular in shape, with an edge that tapers downwards. Marks are visible on the edge of the lead object indicating that it was levered out of the neck of the vessel. To one side of the object there is a rounded projection. This was formed when the lead ran into the spout of the object. Similar bungs can be seen in the Yorkshire Museum's medieval Collections.